Liz Rea purchased the first five tickets to Altrusa International’s “Loving Spoonsful” tasting luncheon to be held on Oct. 27. Liz Rea has purchased the first five tickets to the most important annual fundraiser of the community-service organization Altrusa International of Washington C.H., Inc.: the tasting luncheon called “Loving Spoonsful.” Now in its eighth year, the festive luncheon will take place on Oct. 27 at the Commission on Aging on South Elm Street. The event will again feature a silent auction and raffles with both large and small prizes in addition to the multitude of dishes prepared by Altrusans and “Friends.” All proceeds this year from the $10 entry fee and the various special activities will benefit Fayette County Headstart, Meals on Wheels and Altrusa scholarships. Doors will open at 11:15 a.m. on that Saturday morning. Since there will be no ticket sales at the door, people hoping to attend should contact any of the 37 local Altrusa members, who will have received their tickets by early September. Questions? Call Melynda Iles at 740-606-5462 for information. 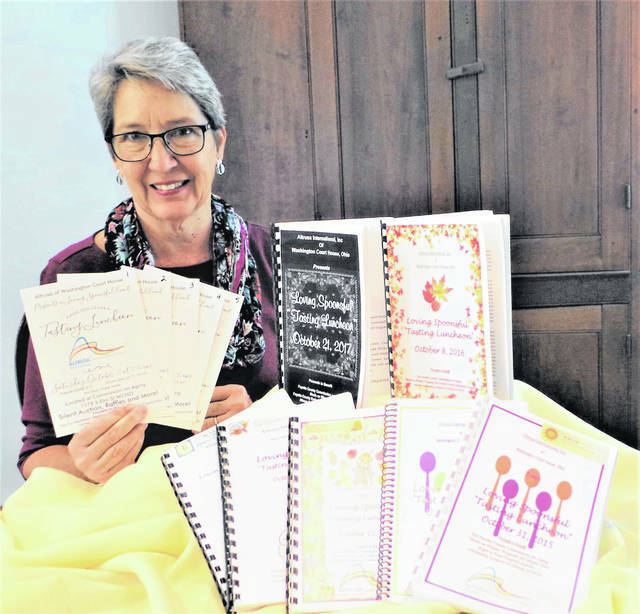 Liz Rea was the first “Friend of Altrusa” to submit a recipe; her “Hot Olive Cheese Puffs” will appear in the souvenir cookbook—containing more than 70 delicious recipes—handed to each luncheon-goer on Oct. 27.
https://www.recordherald.com/wp-content/uploads/sites/27/2018/08/web1_20180822_082824.jpgLiz Rea purchased the first five tickets to Altrusa International’s “Loving Spoonsful” tasting luncheon to be held on Oct. 27.